Do We Buy Used Native American Jewelry? 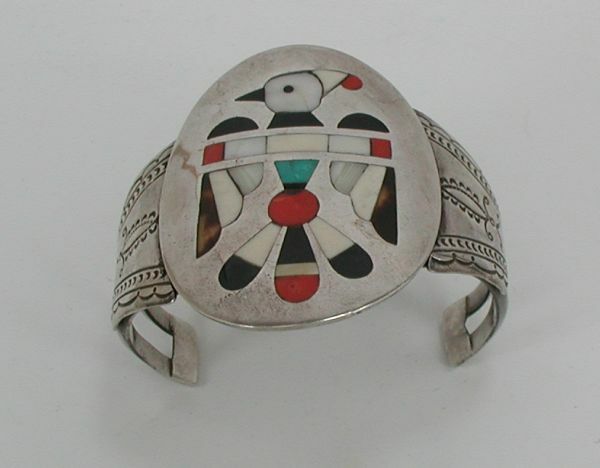 Yes, we do buy used Native American jewelry for our Internet Pawn Shop, but read this entire article to understand a little bit more about older Native American jewelry. What Do I Do with My Wife’s Jewelry? – We are often contacted by people who either have inherited a relative’s collection or who have been collectors themselves and need to downsize. In both cases, often a person’s perception of the value of an item or a collection is influenced by their emotions and what they “feel” something is worth. In the case of a widower dispersing his wife’s jewelry, it is easy to see that there could be emotional attachment to the pieces. And if a collector has certain memories associated with a piece, that piece is worth more to that person because of the emotional element. Patina, the tarnish that forms on sterling silver, is not a problem, in fact, to many collectors it is an asset. So before you sell vintage pieces or get them appraised, don’t clean them up ! Cracks, broken stones, missing stones, loose stones, misshapen bracelets, missing fasteners and bent pieces are a different story – they all decrease the value of the piece. 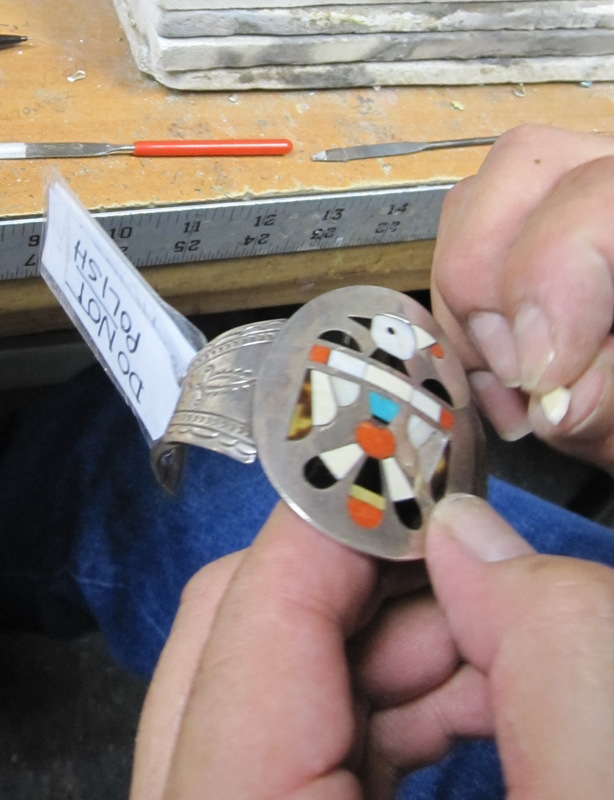 Repair of vintage Native American jewelry is an art. 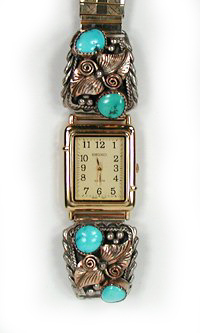 To replace a stone in an inlay bracelet or a squash blossom necklace from the 1940s and have it “blend” is difficult to do. As we appraise a damaged piece, we have to factor in whether it CAN be repaired and the repair costs. Before you contact us about a piece you have for sale, please inspect it carefully with a magnifying glass for missing pieces, cracks, chips, and other defects. In the majority of lots we have purchased, although all might be said to be in undamaged condition, there are always a few pieces that have one piece of inlay missing or a couple of broken or replaced stones in a turquoise necklace or other such things. We assume they were just missed by the seller but the fact that they are damaged usually means that we value them very low or at zero when making an offer. Establishing Value – Quite often a seller will contact us after they have taken the collection to a pawn shop or a precious metals buyer and learned that the only offer they will get there is scrap price (the value of the meltdown of sterling silver and gold) for their collection. They are heartbroken at the thought of seeing such fine and cherished work destroyed. In some cases like that we come to the rescue and find good homes for pieces in the collection! In other cases, a seller will take their items to a knowledgeable person and learn that what they thought was sterling silver is not. Or that the items were made in Mexico or Asia and although they have a Native American look, they are not authentic Native American Made. Even if the seller does his or her homework, and in good faith sends what he thinks is a Native American collection, when we receive it, 20% of the items are either not authentic Native American made or have some damage that decreases their value. Those items usually go into our Bargain Barn which is like a garage sale on the internet –a place where things go where the origin is unknown or the item is in rough shape. Don’t expect to get retail or close to it when you sell a collection or even a single piece. It just doesn’t work that way. As Mike Wolfe often says on American Pickers, “There has to be some meat left on the bone” for us to handle the piece and find a buyer. We do not do appraisals for estates or insurance purposes. We do not make offers based on photos. We evaluate items and collections that are sent to us following the process outlined below. That is how we arrive at an offer. Send us an email. (visit our website to contact us) briefly outlining what you have. Do not send unsolicited photos, they will go to SPAM and we will not see them. If it sounds like something we might be interested in purchasing, we will ask for one or two group photos and your asking price. Please only send a few photos. We will ask for more if we need them. Upon arrival, we closely inspect each item, research the documentation or hallmarks, and assign a value to each piece. We make an offer on the collection. If the offer is accepted, we pay promptly via PayPal or check. If the offer would be rejected, we would ship the lot back to the seller, insured and at the seller’s expense. Because of the above detailed process and the fact that we offer fair prices, in all the years we have been doing this, we have come to an agreement with all but one seller – we have only had to return one collection. As they say: a win-win situation. “I can see why you were recommended to me concerning my [bear claw] necklace. You are very, very thorough! I believe you are trustworthy and I will take your offer as fair so that the necklace is yours. I know if [you find] they are real bear claws, you will send me another payment. Thanks so much for taking the time and making the effort and being fair and honest. 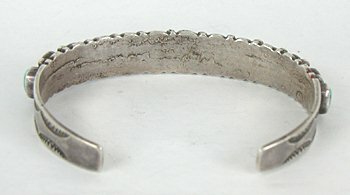 What is my scrap sterling silver jewelry worth? What determines that jewelry is scrap? It depends on whether something is worthwhile to fix, has sentimental value, whether it is collectible, hallmarked, and other factors. When you are selling broken or otherwise unsalable sterling silver jewelry, you might be offered scrap price or melt value for the items. 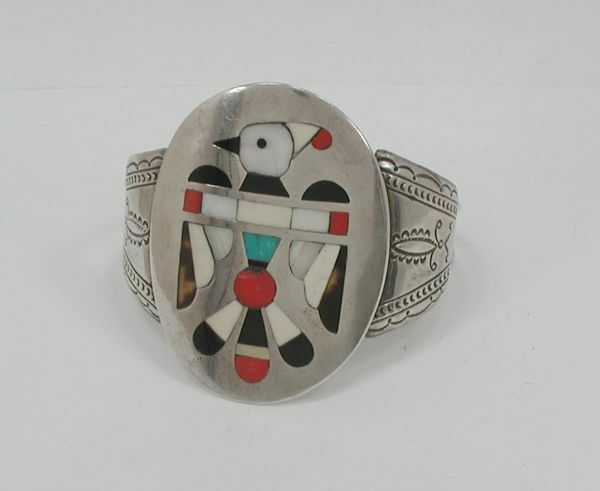 And even if you have undamaged Native American jewelry and you take it to a pawn shop where the pawn broker isn’t interested in or knowledgeable about the value of Native American jewelry, you will likely be offered melt value. Here’s how you can figure the melt value of your jewelry. First be sure the items are sterling silver. If you don’t have an acid test kit yourself, you can take the items to a jeweler to test for you. Next you’d weigh the items. If there are a lot of stones or materials other than the sterling silver, you could either remove those so you’d get a more accurate sterling silver weight OR you could estimate how much of the weight is stone. This will vary depending on the piece so you can make your guesstimate and likely the pawn shop owner will make his. For an example, if a heavy silver bracelet that weighs 125 grams has stones estimated to be 30% of the weight of the bracelet, then you would have 70% of the weight as sterling silver or 87.5 grams. But sterling silver is only 92.5% silver, so of the 87.5 grams, only 80.9 grams are silver. Silver is measured by troy ounces and there are 31.1 grams in a troy ounce. So in 80.9 grams of silver, you would have 2.6 troy ounces of silver. It costs to have sterling silver melted and purified, so if silver is running, say $30 an ounce, you might be offered $30 or less per ounce. 2.6 troy ounces of silver x $30 per troy ounce = $78.